Milford Sound isn't convenient to any major city nor is it on the way to anywhere else. The road there is a dead end. Yet its majesty and grandeur have made it arguably New Zealand's most famous tourist destination, a winner of TripAdvisor's Traveler's Choice Destination Awards, and even acclaimed by some like Rudyard Kipling as the eighth wonder of the world. Naturally, we had to see what all the buzz was about. You don't just "hop over" to "check out" the Milford Sound. It is nearly a 4 hour drive from Queenstown with the last hour being almost exclusively made up of hairpin turns through mountains. The views are absolutely stunning. 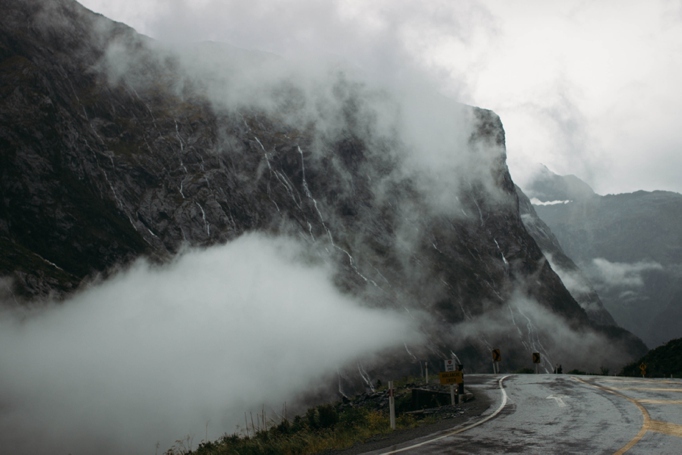 It's during this last stage of the drive that you get your first taste of the sheer-faced mountains that continue on to the sound and the waterfalls that seemingly pour from the clouds. At the peak of the Milford Pass where you begin your decent to the sound, you drive through these rock monstrosities in a kilometer long, single-lane tunnel that has been roughly cut out as evidenced by the streams of water that pour down its inner walls. 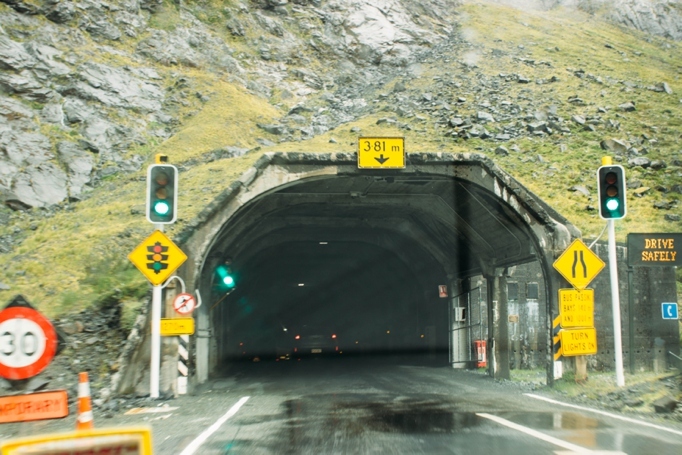 Once you've begun the descent, give your brakes a rest and check out The Chasm that will be signed well on the left-hand side of the road. A 1o minute walk takes you to footbridge over a river where the turquoise glacier water has creatively sculpted the surrounding rock. We had gotten some funny looks back in Queenstown when telling people we would be spending 3 nights in Milford Sound (we cut this back to 2 nights once we arrived). Our naive thought was that a place this epic probably deserves at least this much time. Little did we know that, while Milford Sound is naturally rich, it the home of only 150 residents, 2 hotels, 1 restaurant, a gas station, 0 cell reception and the most outrageous internet prices around. As a Unesco Heritage site, all hiking and kayaking in the sound requires a guide and their rather expensive rates. However, for those with a slim budget like ours, there are some great free hikes in the area like the 3 hour roundtrip trek to Lake Marian. The trail is certainly steep but crossed over a great suspension footbridge and a series of waterfalls before eventually open up to this tranquil lake cradled among glacier peaks. Well worth the sweat! The worthwhile benefit of spending the night in Milford Sound was the ability to catch the first boat tour of the day before any of the buses could make it into town. We spent our nights at The Milford Lodge (whose spartan and expensive rooms were unimpressive) and they were able to offer a discount when booking for an excursion with Southern Discoveries. As an added perk, a complementary buffet breakfast was offered for the first cruise of the day and served on the boat. Thanks to the nearly constant rain we had while there (just plan for being wet--they average rain 360 days a year and over 30 feet annually), hundreds of waterfalls came alive and spit from the cliffs into the sound below. To add excitement the captain would navigate us close enough to many of the major falls to feel their rumble and see the seal colonies that fish around the base. Instead of spending our originally planned third night in Milford Sound, we packed up and made our way the hour out of the sound to the scenic, lakeside town of Te Anau. In hindsight, this would be our recommended launching point to into Milford as it still has a quaint, small-town feel but with the luxuries of food and insect repellant. Te Anau is certainly less rainy than its counterpart but was still a little chilly so we enjoyed some delicious sandwiches and soup at both The Sandfly Cafe and The Olive Tree Cafe. We had a little extra time after exploring around Lake Te Anau and headed 20 minutes east to the small town of Manapouri that sits on its own equally as stunning (if not more) lake. Devoid of tourists, it was here that we found one of our favorite locals' spot at Pearl Harbor, a tasty pub/restaurant that was constructed out of various pieces of churches collected from around the south island. Don't be intimated by the group of kiwis that will certainly give you a curious look as you walk in the door. Simply pull up a stool at the bar and order and a Tui I.P.A. as you spark up a conversation with these friendly chaps. What are some travel planning mistakes you've made that you wish you could pass along?